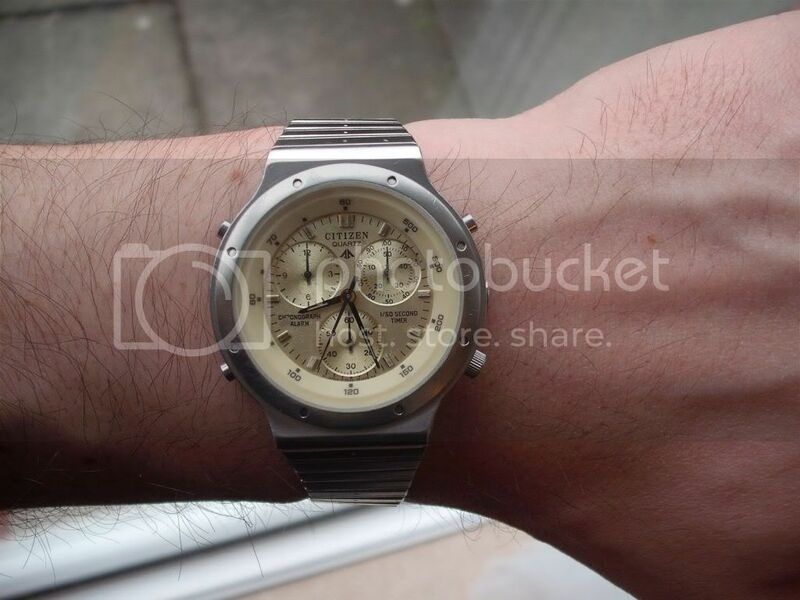 Forum Home > Non-Seiko General Discussion Area - Contemporary Chrono's > Do you have a Citizen 3530? Let me see then! Let's just start with my childhood....haha....no, just kidding. But I need to write something for introduction to make the story more mysterious and exciting. When I was 6-8years (1988-1990) old my father already had his 7A38-7020. In that time it was really incredible to own something which came outside from communism. For example something which came from West Germany, Japan or USA had a huge value. I don't know how but my parents had couple of OTTO catalogues from West Germany, and we had some kind of Austrian magazines as well. Why is it important? Because I have seen these 7AXX and 35XX watches first time in these catalogue. Sorry for my ignorance but until last year I didn't know what is the movement number for this Citizen 3530 but I did recognise it. I was browsing on RLT forum and a conversation between Paul and Achim (alias Gufi) popped into my eyes with a very nice picture about a black dial, stainless steel 3530. I recognised it immediately. After reading the topic for some reason I lost my interest about them and I forgot the movement number again. BUT!!! I'm never gonna forget again! I read the whole document and I wanted the watch more than anything else. I was really curious about it. the dial of the watch was in very bad condition, dirty, there was some kind of liquid on it. the crystal & crystal gasket & tachymeter ring were GLUED into the bezel!!!! I have managed to remove the ugly black paint, I had a Cousin 31503350 case back gasket whick was perfect for the case back, I put a buzzer spring to make contact with the piezo-electric speaker so now alarm has sound, I pressed out the crystal, cleaned the tachy ring, crystal & gasket properly and put them back. As I have no idea where are my c-clips I didn't do anything about the pusher. I tried to clean the dial but it was impossible I gave up finally. It's a shame about the dial, everything else is OK for daily wearing. All the functions work perfectly as they should. 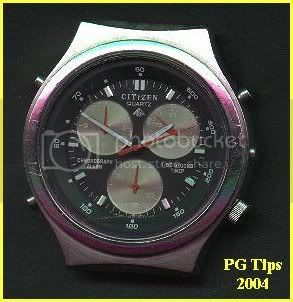 Everybody knows the old story that Citizen made these watches to be a competitor agains the Seiko 7AXX series. Precisely the 3530 (and 3531) against 7A28, the 3510 & 3560 against 7A38 and lastly the 3570 againts the 7A48 moonphase series. I impressed with this Citizen, honestly. Its functionality is just perfect. Stainless steel as you would expect. It's slightly bigger in diameter than my Seiko 7A38-7190 but is thinner. I have to admit Seiko has a more precise, sophisticated case. On my 3530 there is no separate bezel, therefore there is no bezel gasket too. The way to put the crystal in it is the same as on 7A38. Althougt the diameter of 3530 is slightly bigger but the diameter of the dial (what you can see actually) is smaller. It's pobably because the tachymeter ring is wider. As a result of this there is limited place on the dial, therefore the 3 subdials are closer to each other. Plus it's tend to be a Citizen trade mark that they put too much marks, notices on the surface of the dial. Yes, the dial is a bit crowded. The other reason for this because the chrono is able to measure the 1/50 second and Citizen put every mark on the sub dials. For me the Seiko has a more logic, simplier, easily readable dial. No offense to 3530 but it took me a while to get use to it. Everybody knows the abilities of 7A38. But what about the 3530? To enter the chrono mode you need to activate it. 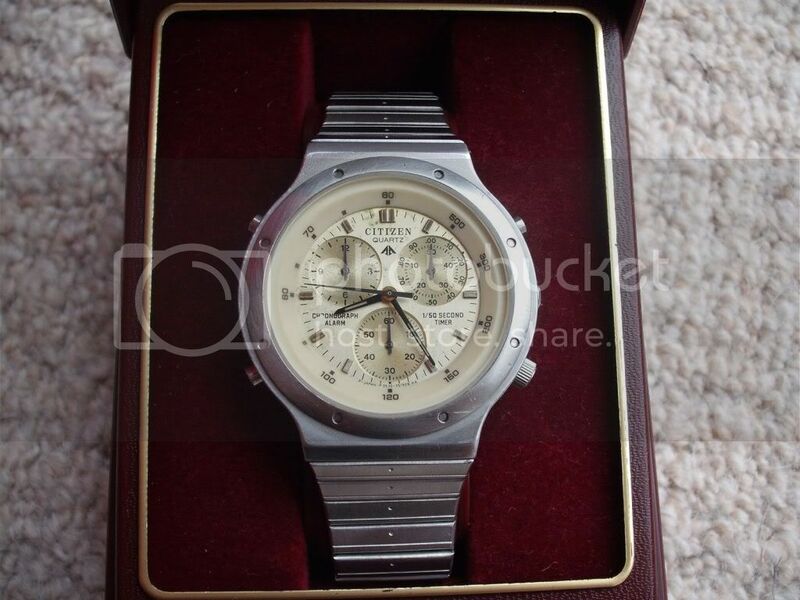 (it uses the same second hand for normal time keeping and for chrono) It measures 1/50 of second, second, minute, hours. One down side about the 3530 that it has no split time function. And another: as the chrono minute and hour hands have no separate stepper motors they are connected to the second hand and they are moving slowly but continuously. (1/50 sec and sec .have step movement)...you have get familiar with it to read the minute results, or at least do couple of test measurements. Unfortunately the chrono minute hand is not long enough so you have to extent the hand virtually with your eyes to point to the right mark. (It is not general, this is model specific) OK, it seems I'm quite negative with 3530 but no, these are just facts. With 7A38 you have counter function is you pull out the crown to its first click position. Then you can count with the 1/20 sec upto 20, with the second up to 60 and finally with the minute upto 30. Very good. During this, the normal time keeping is still going, but you can accidentaly adjust the day &date. The 3530 is able to count up to 50 using its 1/50 sec hand. But you don't have to pull out the crown and normal timekeeping is also going. Excellent. 3530 is far better in this. The 1/50 sec hand has a very trick notices in its sub dial, it's easier to set up the required remaing time. And if the hand reaches the zero position you have a beep sound. This is a real timer. It works on minute basis from 1-50 minutes. Meanwhile 7A38 also has timer function but I would rather call is reverse stopwatch function. And also you have to pull out the crown first to set up the reqired remaing time. And if the hands reach the zero position there is no sound at all. To be honest with you every analog watch which has second hand can be used as a timer....but I would call them timer...its a bit white lie. Easy to compare as 7A38 has no alarm function. Whereas 3530 has a very nice alarm system, using the same hands which indicate the normal time. Both of them are excellent design, made by metal parts (gears, cogs etc). 7A38 has 15 jewels, 3530 has only 12 jewels. After opening the case back and operate the pushers it is obvious: the 3530 has far more complex and complicated movement. 7A28/38 has 4 separate stepper motors whereas 3530 has only 3. (And it is able to do almost the same, or even more...think about the real timer and alarm function) What I really like about 3530 movement if you pull the crown out to the second click the second hand automatically reset to zero, very useful feature. I must say Citizen engineers did an extremely good job! 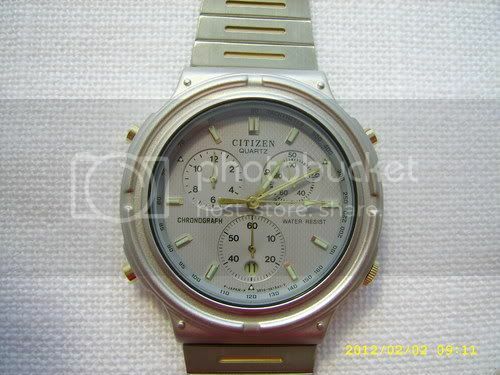 Unfortunately on this particular 3530 model Citizen didn't put too much effort about the bracelet. It looks like a cheap Casio databank (DB-500, DB-510, DB-520) style. The 3530 & 3510 are a "must have" watch!! Probably they caused serious headache for Seiko! But .... like you said - Shame about the face. That Cal. 3530 obviously uses the same case and bracelet as the one which first aroused my interest. The dial is virtually the same too, except it's a Champagne colour with gold detailing (and 'speckles'), rather than Black with white. But something looks wrong with yours. 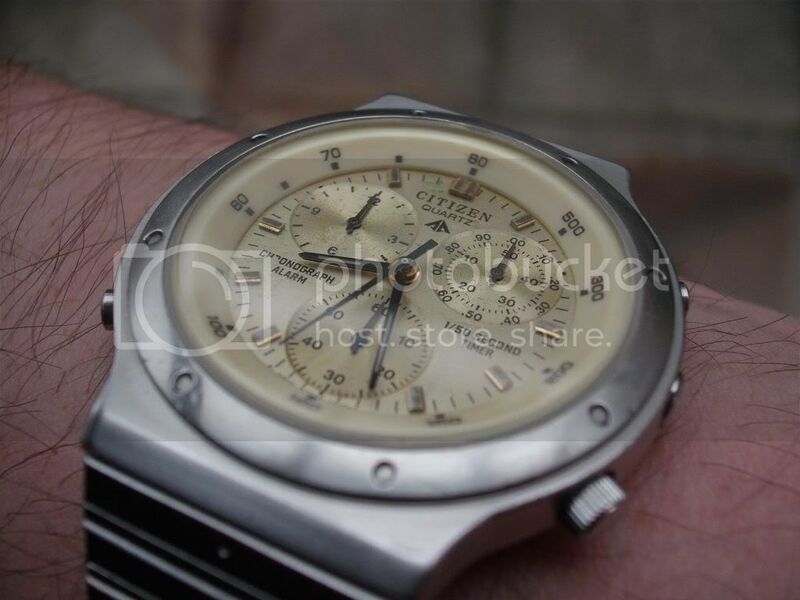 That Tachymeter dial ring is just too plain (for Citizen). Acres of creamy coloured blank plastic. Do you think it's possibly missing an upper dial ring ? Or that originally, there might have been decal printing underneath the crystal ? It is the same tachmeter ring but in black colour. Which is interesting because the numbers on the case-back after the 3530 tells you the case model/case design. Mine is 351207 TA and the other one has the same. Moreover on Derek's black dial 3530 the case is the same as mine, the same shape, same matte finish but the case number for that one is: 351177 TA. So?? Definately there are lots of things to figure about these Citizens. 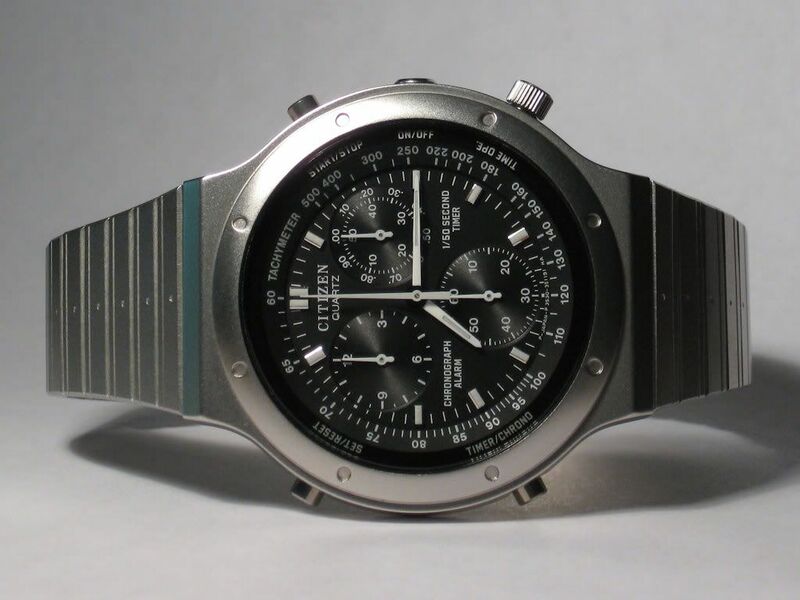 Back to tachymeter ring dilemma: Maybe they tried to compensate the over crowded dial using a plain, wide tachy ring. Did they get the aimed balance? ...the answer depends on the individual person. I think there is/was no any other ring as there is no space for them between the movement (dial) and the crystal. I'm happy that there is no printed decal....those are great and suitable for Casio watches but not for these analoge ones. Ohhh, in my 3530 (3510) vs. 7A28 (7A38) comparison session I forgot to mention something regarding to the chronograph function. On 7A28 (7A38) the 1/10th second hand stops at zero position after 10minutes, but if you stop the chrono this hand will of course indicate the 1/10sec result, but if you restart it the 1/10th sec hand goes back to zero position again...so in one word: I doesn`t move after 10minutes. What about the 3530 (3510) ? It`s a bit different. After 3 minutes the 1/50th sec hand stops at zero position. If you stop the chrono after 3 minutes of course the 1/50th sec hand will indicate its result. BUT!! If you resart it the 1/50th sec hand won`t go back to zero but it keeps rotating again...until another 3 minutes...where it stops again. Nice, isn`t? Perhaps everybody can understand why I said that the 35XX movement is far more complex and complicated....in functional wise. 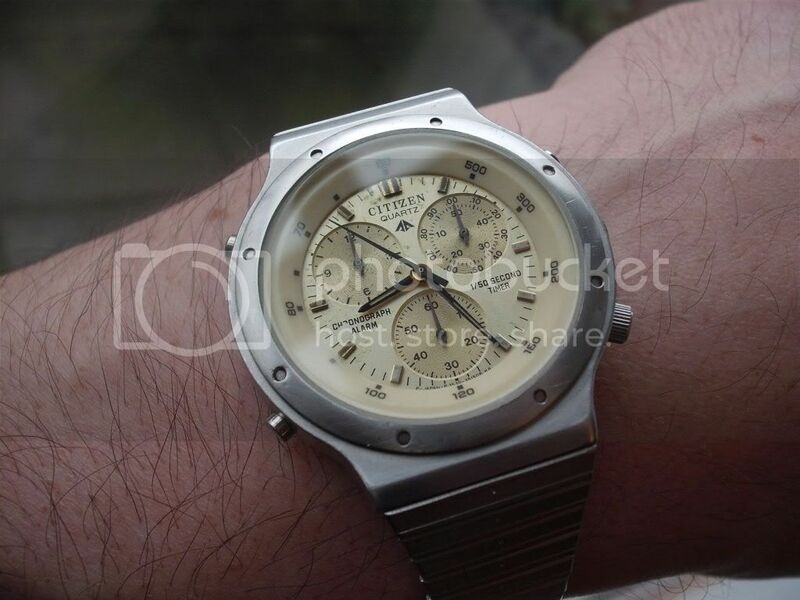 Unfortunately I had to return my 3530 to the seller, because its condition didn`t match with the item description. But I definately have to get one of these 35XX. Does anyone has a friend in Germany who can help me to bid on this one? Unfortunately the seller doesn`t want to post it to UK. Which I don`t really understand honestly...because he has to go to Post Office anyway...so is it really matter what is the address on the envelope as I will pay the postage anyway??? 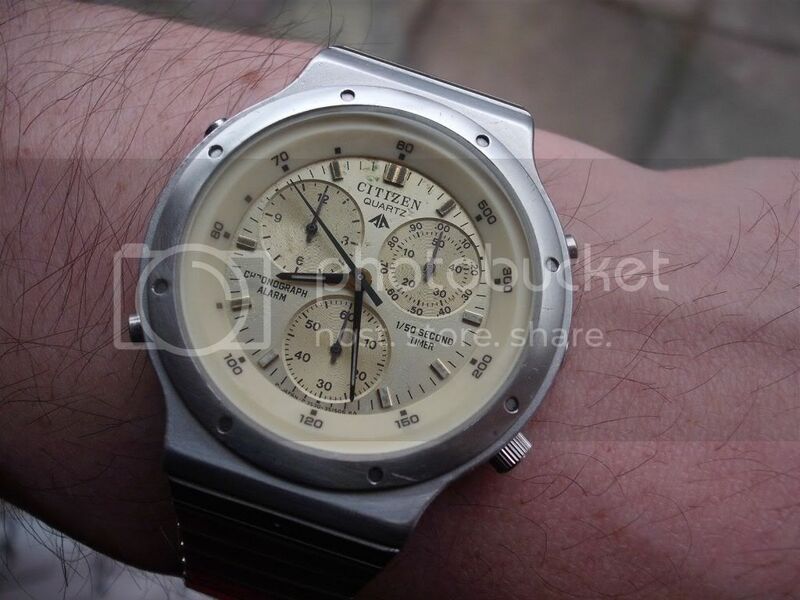 A very nice review of the Citizen chrono! 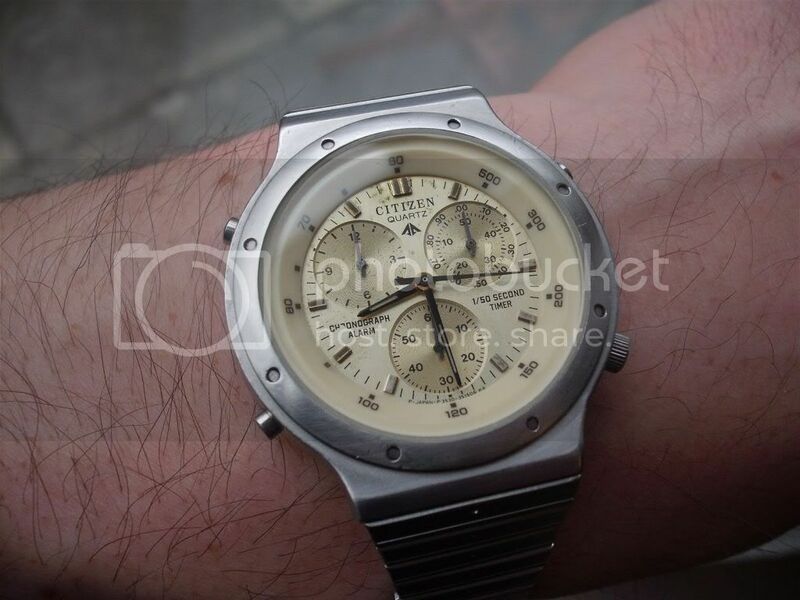 Like you I like these Citizen 35xx a lot. I think it´s useless to argue whether Seiko´s 7Axx or the Citizen´s 35xx are better. They are both very nice watches with some different functions and designs. The already above mentionned Cal. 3530 I had some time back too; unfortunately with the wrong bracelet and a polished case instead of the matte finish. And here is an example of a Cal. 3531 that I owned a while back.